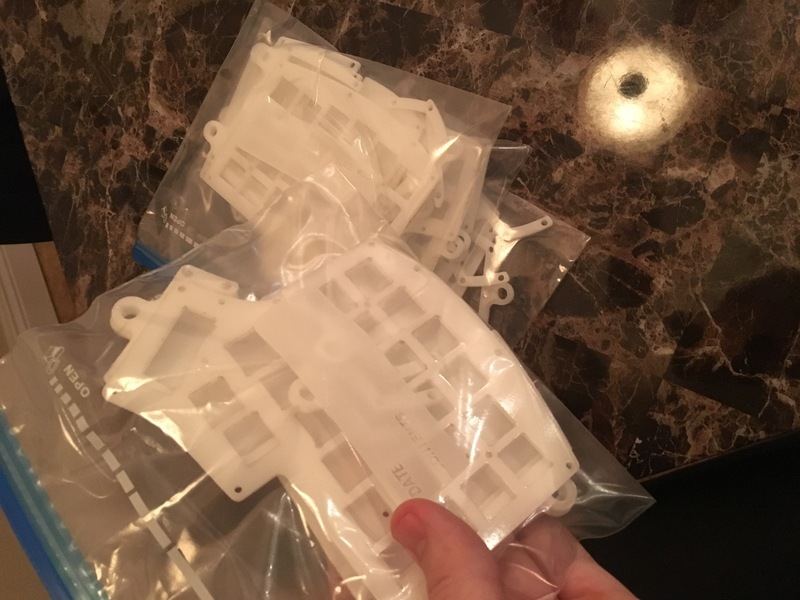 A few more parts arrived but I’m still waiting on the case. Still waiting on the case pieces which should come within the next few business days. 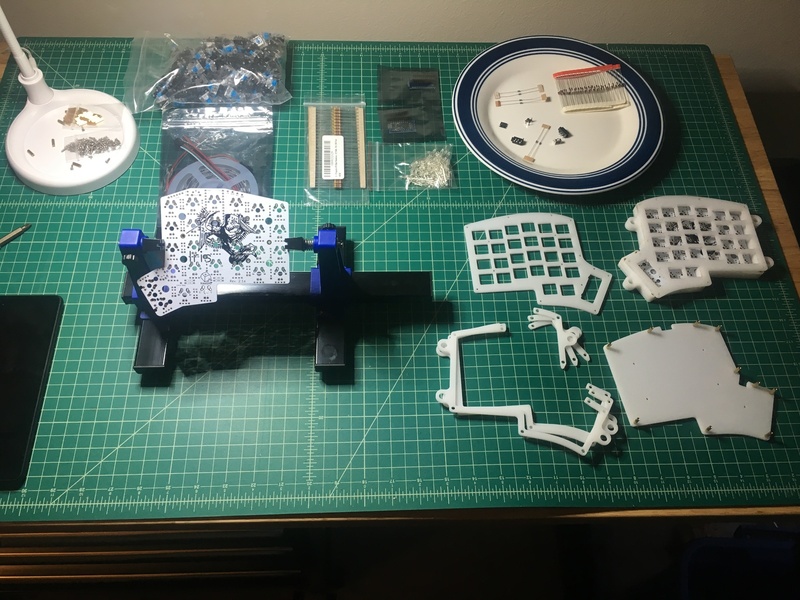 Hopefully I’ll get started on the build this weekend. 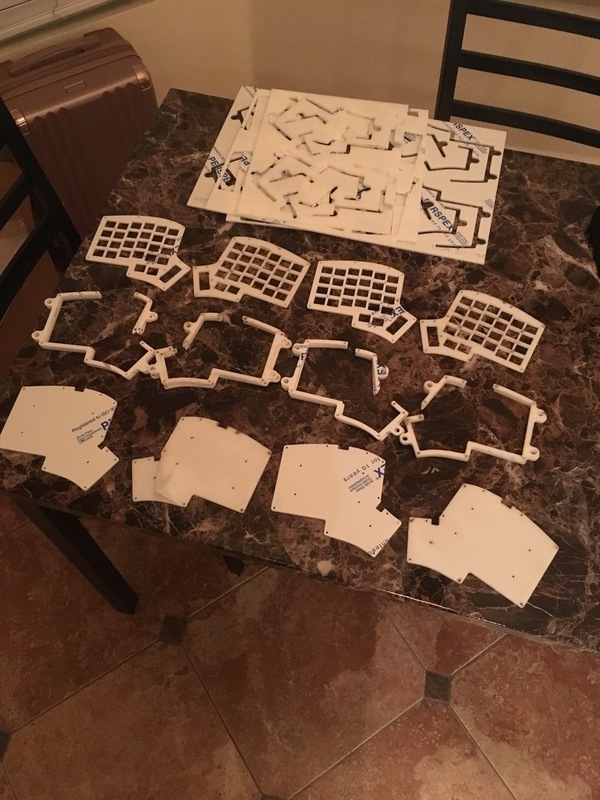 Case pieces arrived and I prepared and organized them. Today the “final” pieces of my keyboard arrived. I put final in quotes because I actually realized one more thing I’m missing: the M2 screws. 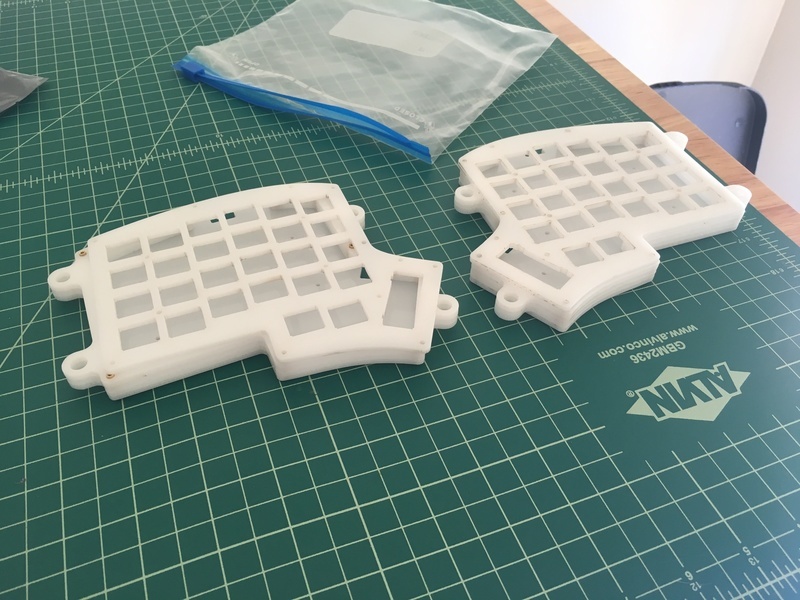 When you buy the case directly from keeb.io the screws are included but obviously (Or not so obviously) if you get the case laser cut from Sculpteo, they are not. Woops! Luckily they can be purchased from Home Depot so I don’t need to wait on another package arriving. 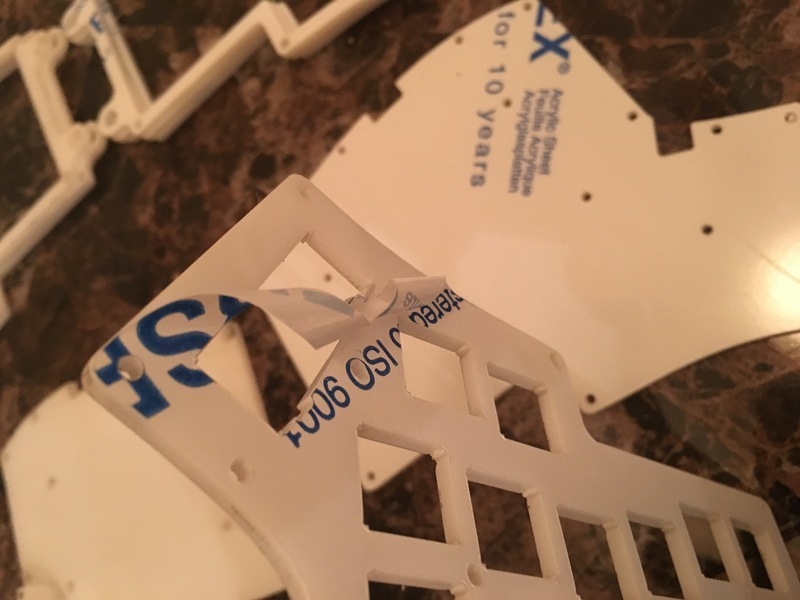 After closer examination, I realized that both sides actually have an adhesive Perspex protective sheet on them which can be peeled off. 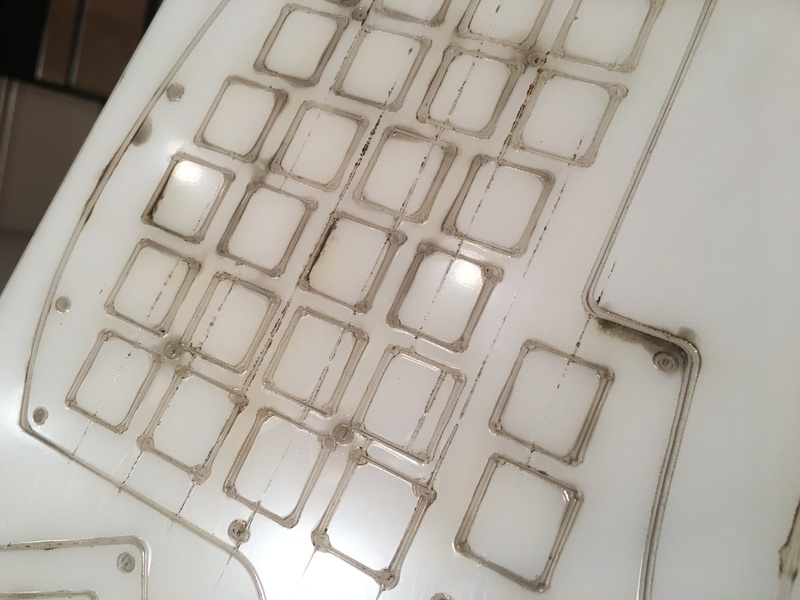 On one hand I’m quite happy because the Acryllic actually looks very nice once it’s removed. On the other hand, I didn’t plan on having to peel off 64 pieces of adhesive. That being said, it’s still much better than the alternative! Everything has arrived and my workstation is set up. 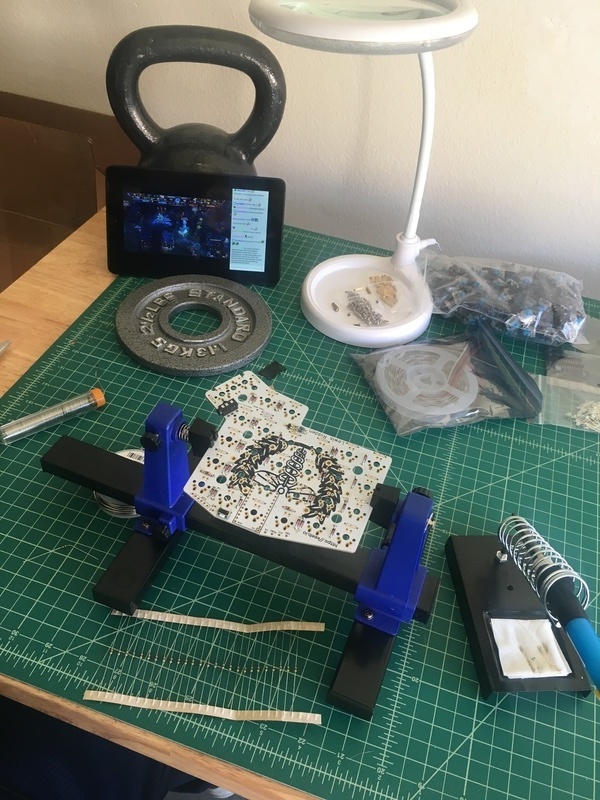 I realized that I needed a couple more tools before I could get started soldering. I bought a lamp and a soldering clamp which both arrived on Monday. 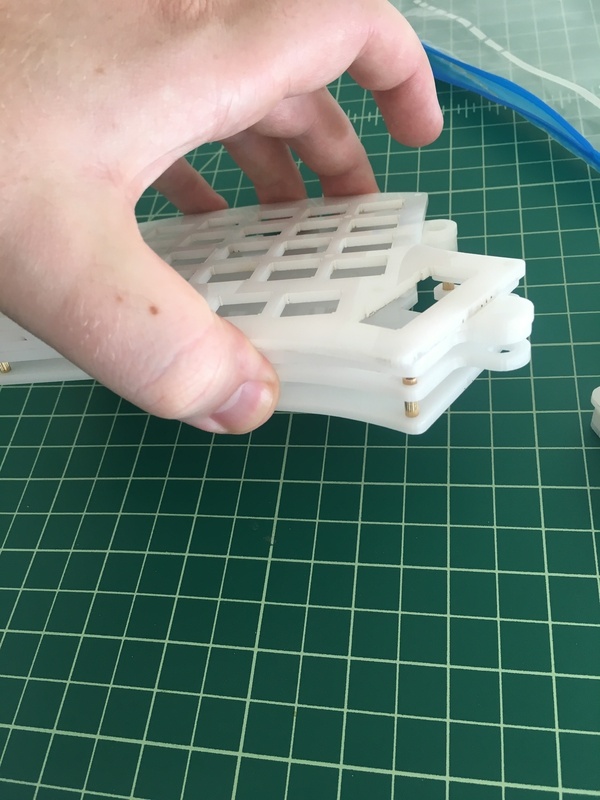 I also got a clamp-mounted phone arm so that I can hopefully take some video during the building process. 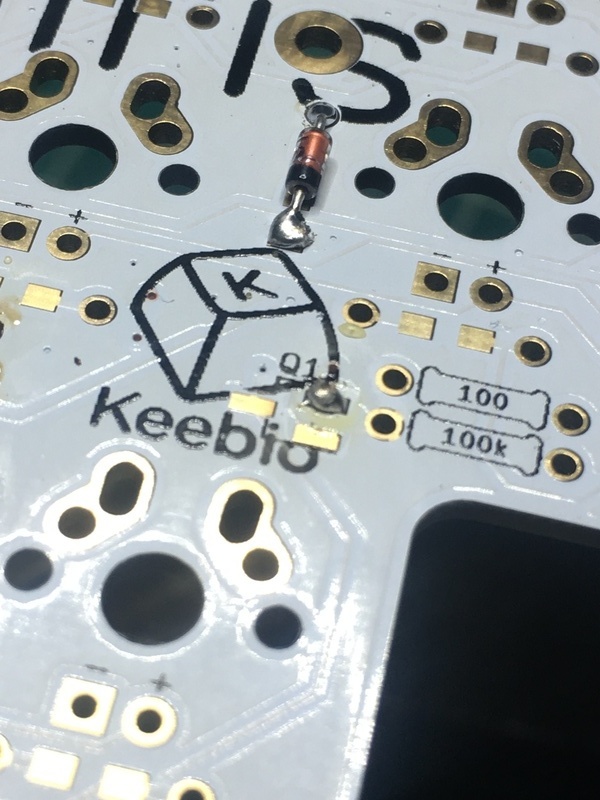 The M2 screws from keebio also came yesterday so now I officially have all the materials. 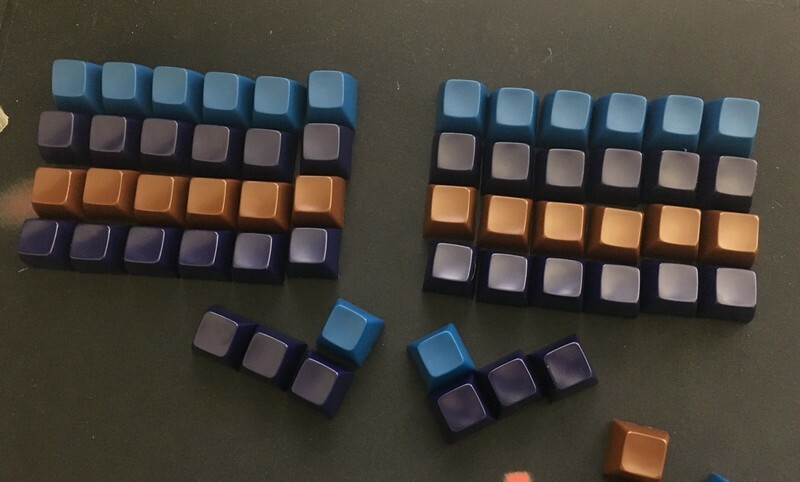 I think I may actually use leftover Gateron blue switches for the first build. 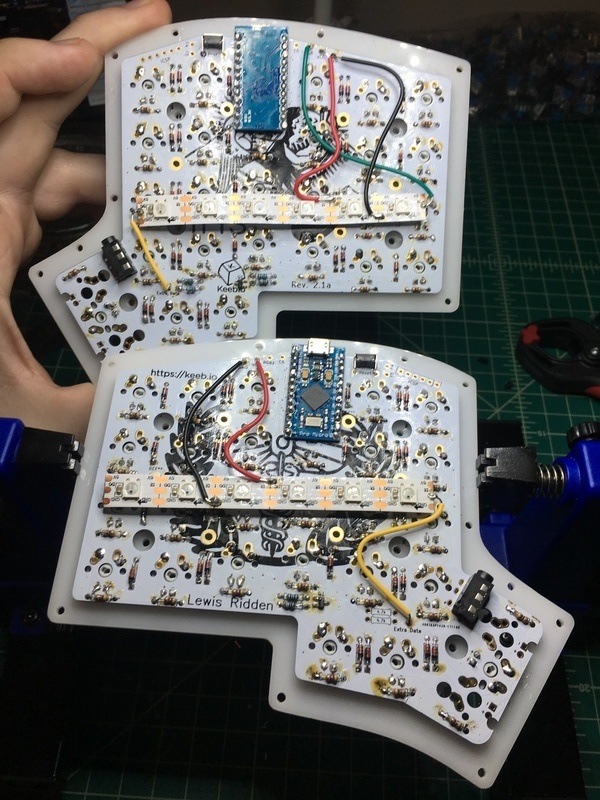 They are PCB mounted which should make things a bit easier. 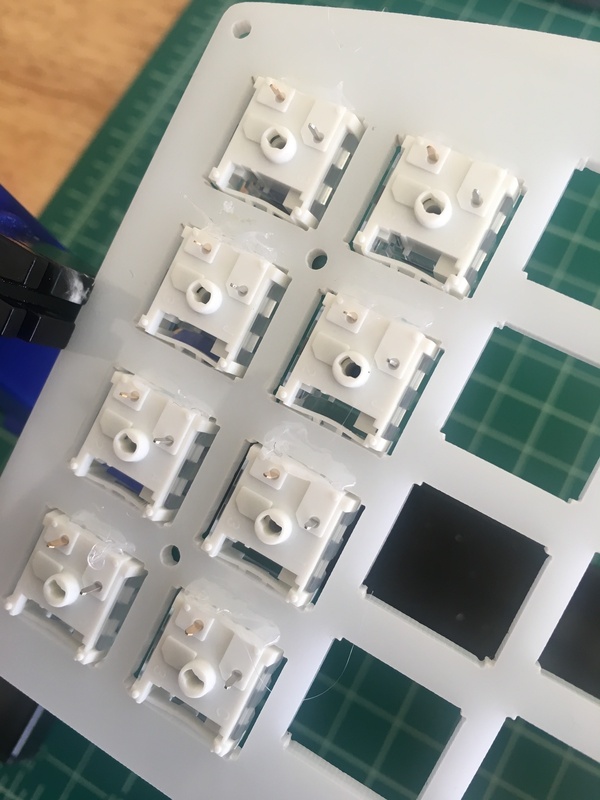 The Kailh box blacks are plate mounted which means it will be easier to accidentally solder them on crooked. 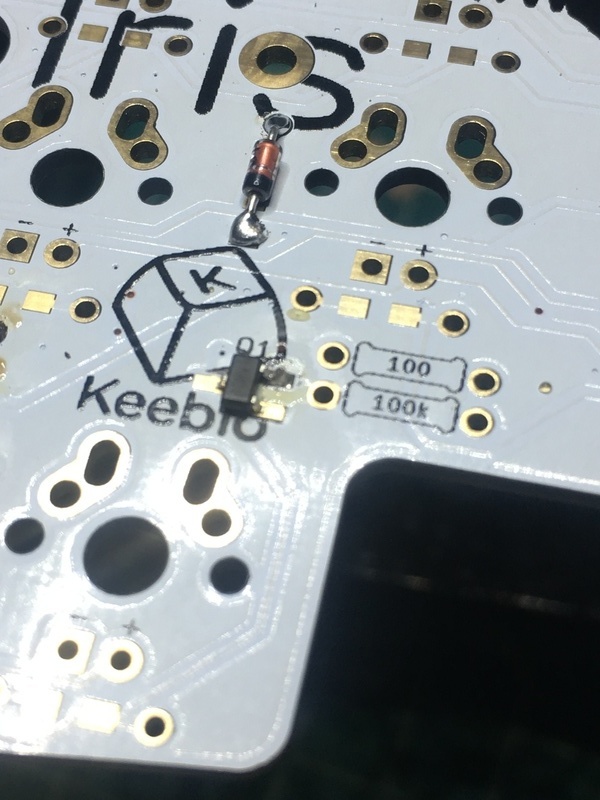 The in-switch LEDs also fit better as the Kailhs are meant to be used with smd LEDs. 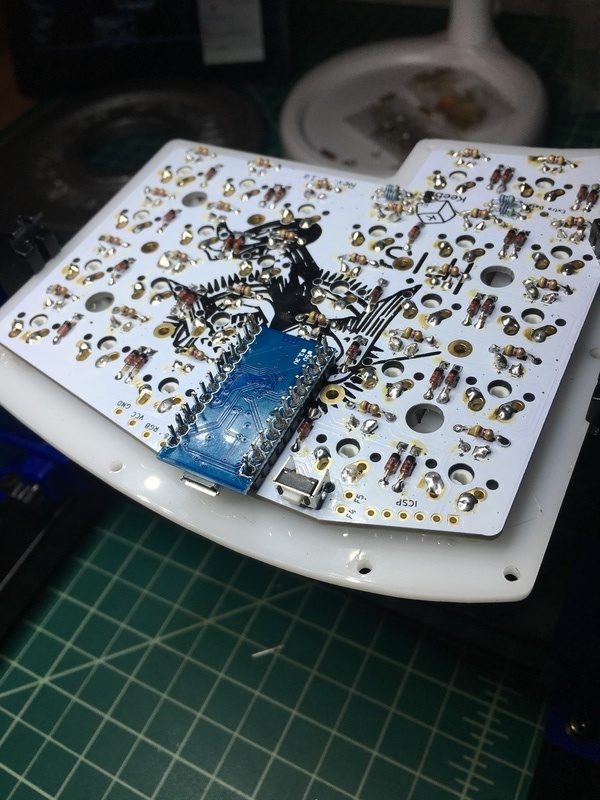 I soldered the TRRS jacks, the reset switches, and the diodes. 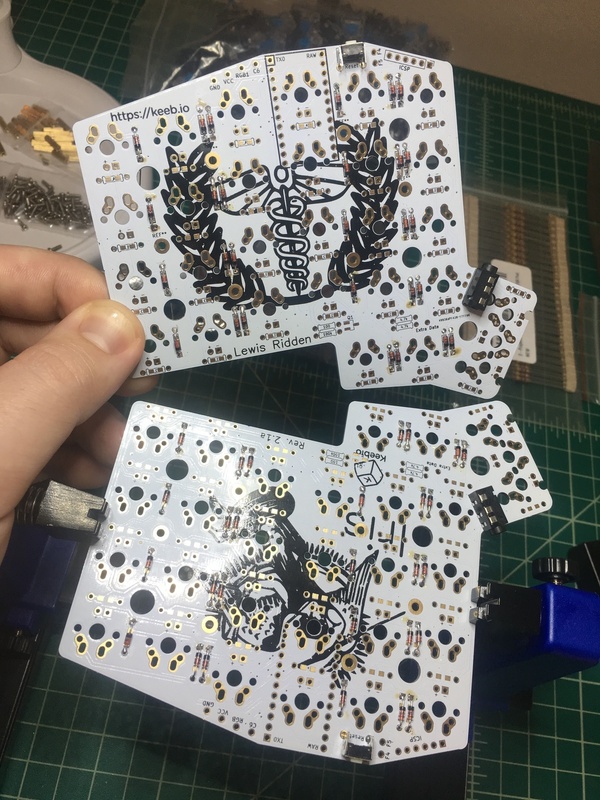 I started on the TRRS jacks. 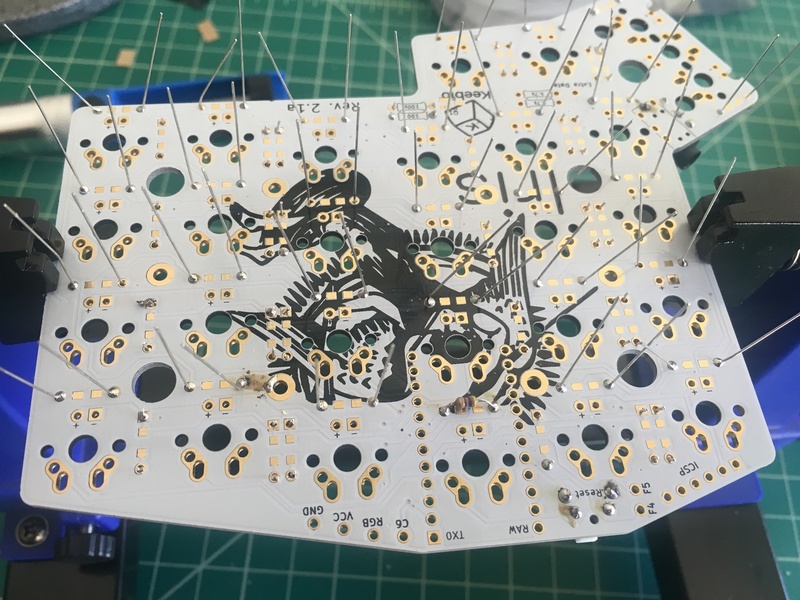 I had to use electrical tape to keep them in place while I soldered the pins. 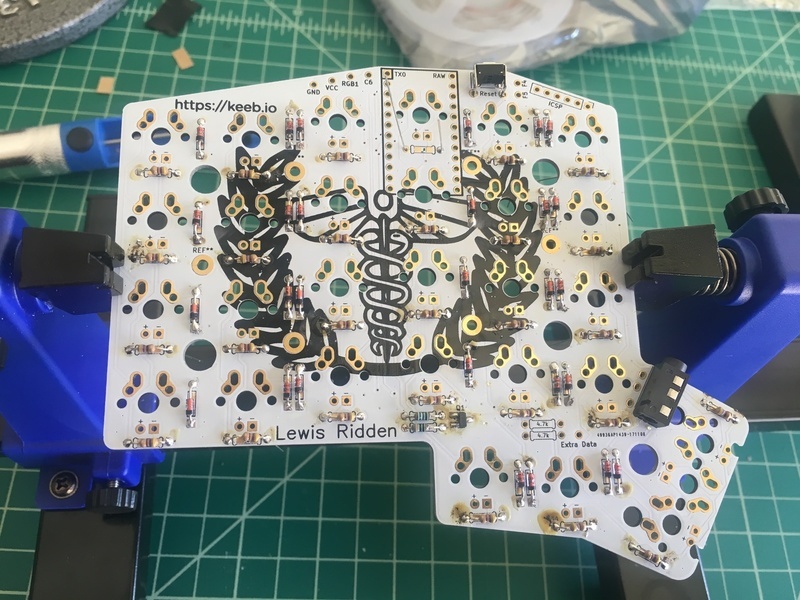 After soldering on the reset switches, I actually wished I did the same as one of them shifted slightly while I was soldering it so it’s a bit crooked. 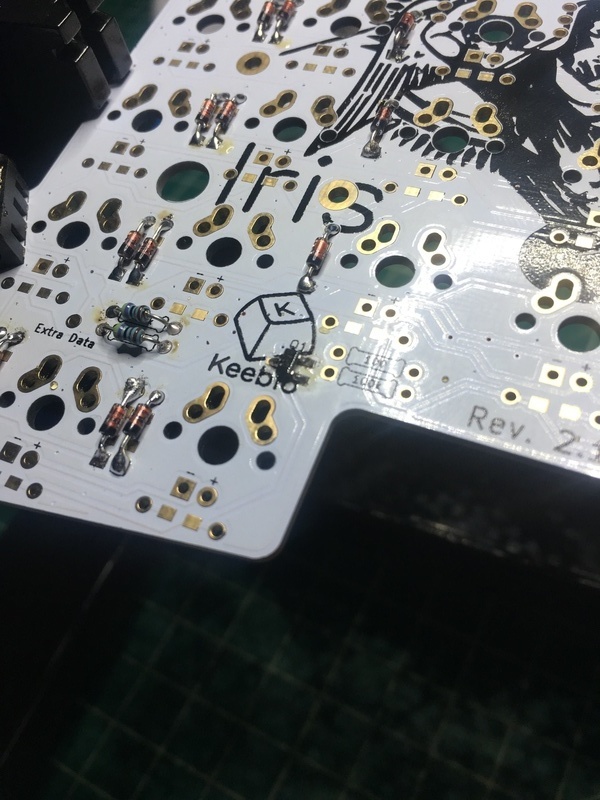 It should still fit in the case just fine so I decided to leave it instead of desolder it and fix it. 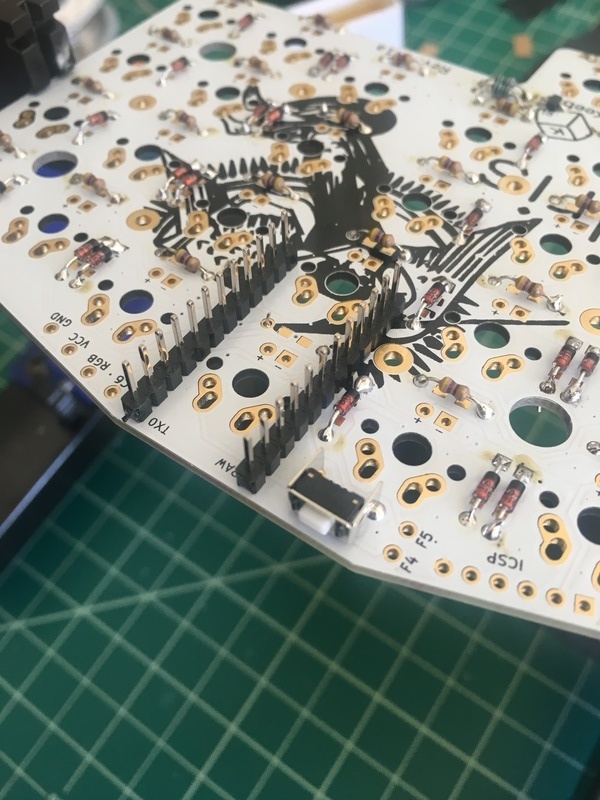 For the diodes, I pulled 28 of them off of the strip and placed them in one PCB. 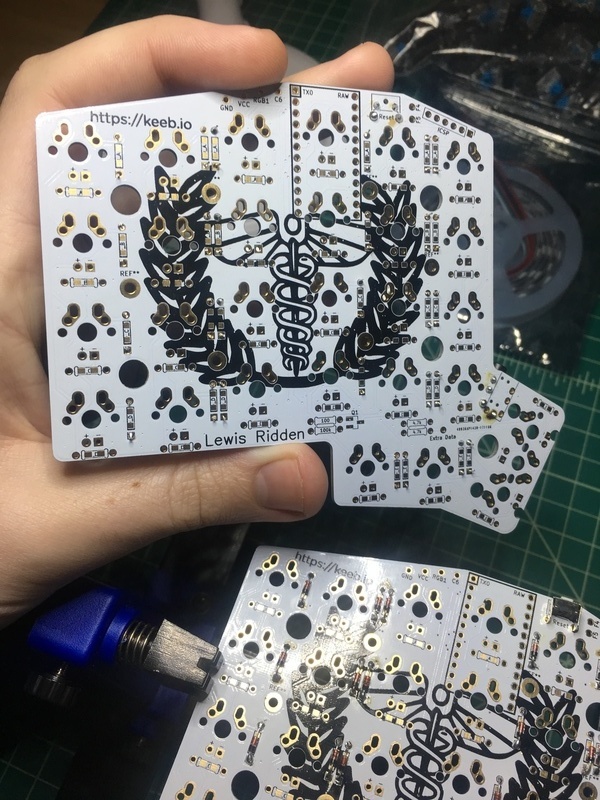 I soldered all of them and then did the same for the other side. 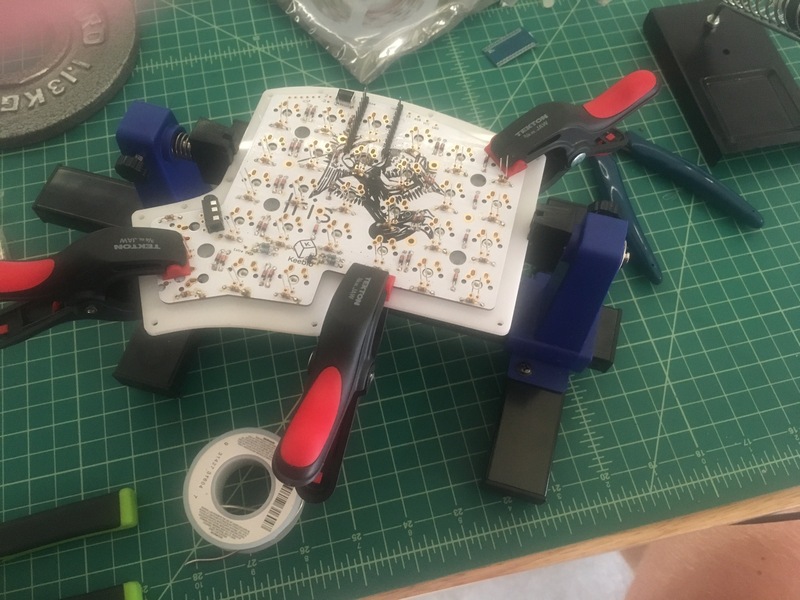 I still need to clip the diode legs but I’ll get to that when I continue on the board later. 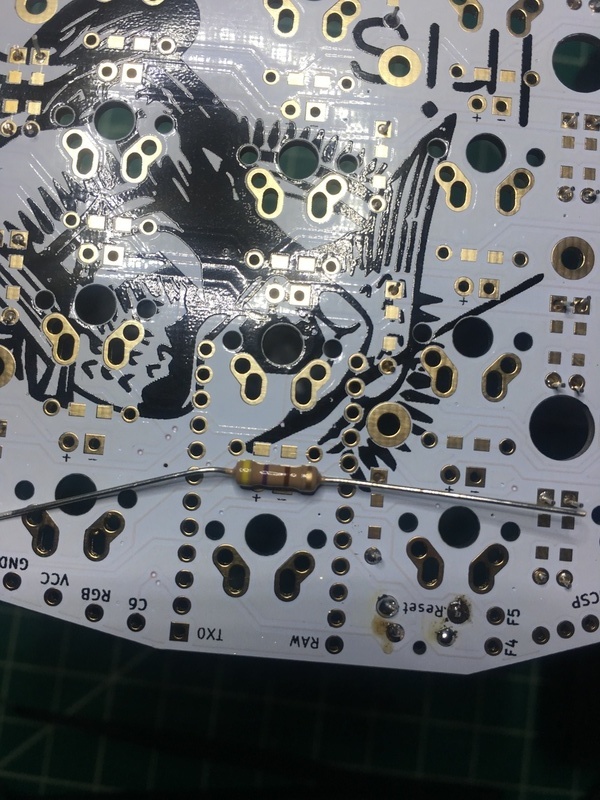 Next up is to solder on the MOSFET, I2C resistors, and resistors for MOSFET. 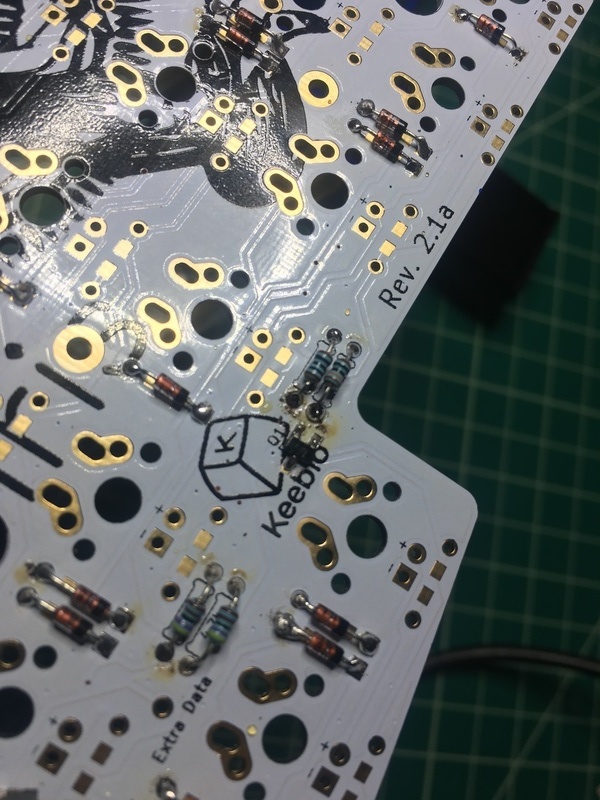 I soldered the I2C resistors, MOSFET, and LED support resistors, then realized my 470k resistors are too big. I got up early again today to try and knock out another big chunk of the build. 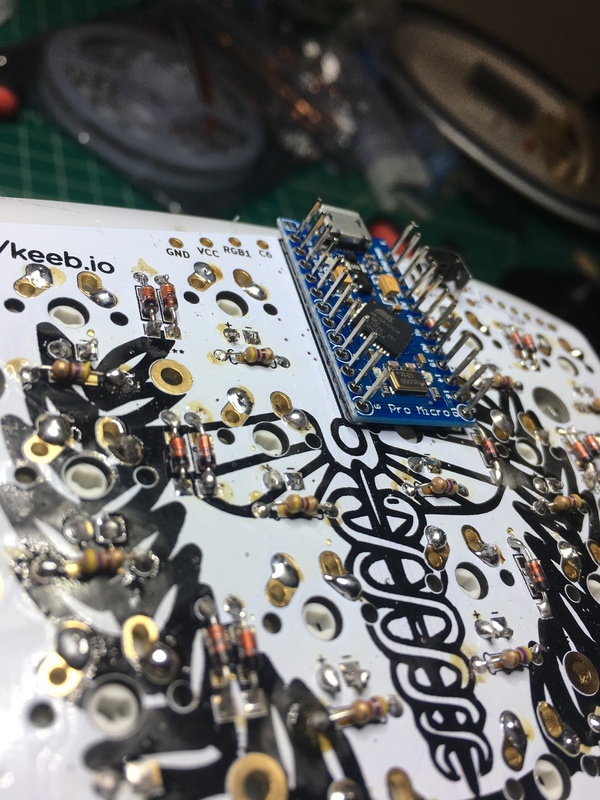 I added the I2C resistors first which is pretty straight forward; I put them on the left half. 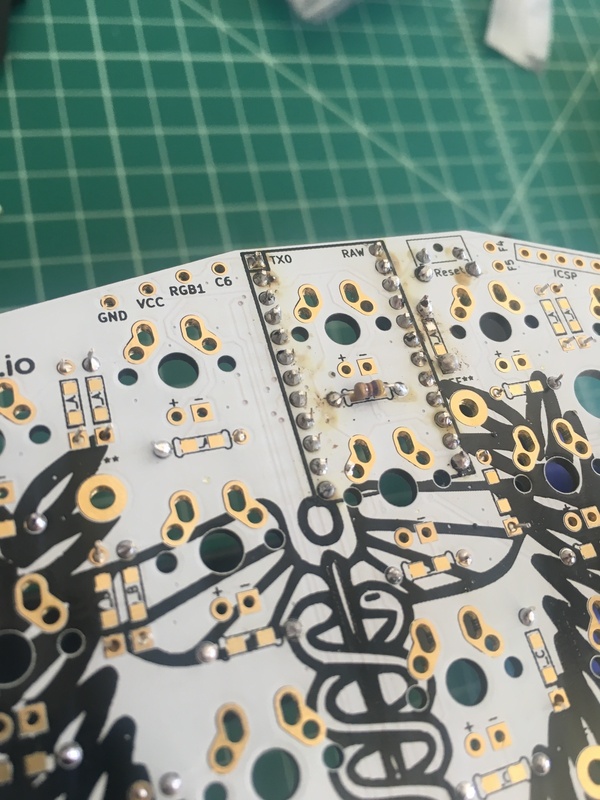 I was going to move on to the switch LED resistors until I realized that the 470 resistors I bought are too big so I need to order smaller ones. 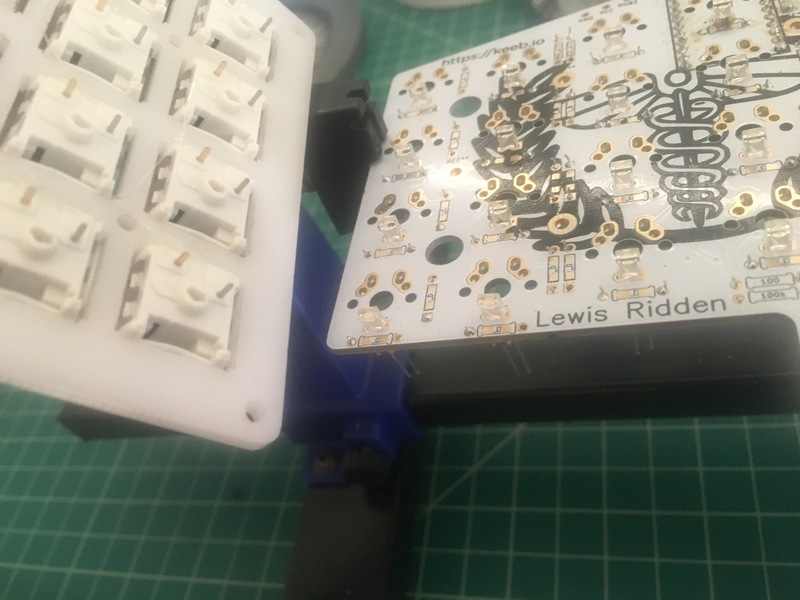 The board is basically done; I just need to create my own QMK keymap and wait for the correct M2 spacers. I read in the guide that you should flash the controllers first just in case they’re faulty so I went inside to do that. Of course in doing so I got a migraine… I took some Ibuprofen, slept for a few hours, and thankfully it passed rather quickly. 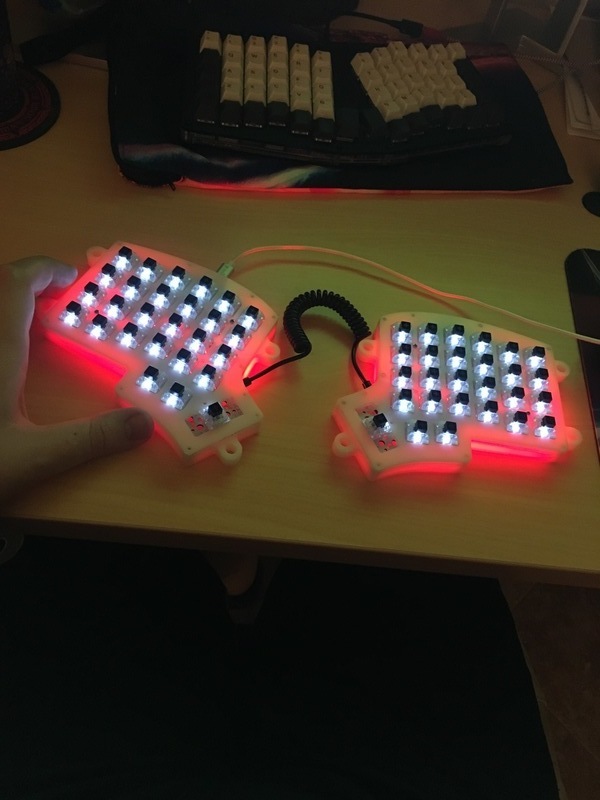 So, I flashed the Pro Micros which was pretty easy having flashed my Atreus62 before and headed back to the garage. This part was pretty simple which was refreshing after the controller shenanigans. 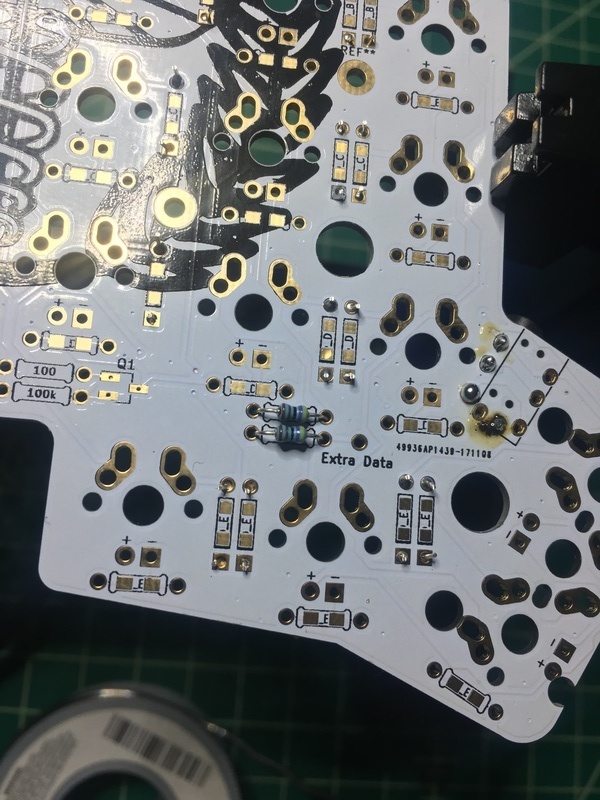 I employed a similar technique I used for the MOSFET component where I would tin the pads on the RGB strip with solder. Then all I had to do was bring the tip of the wire to the pad and heat it up. And the best part of the whole thing was plugging it in and having it just work!